Up next, it’s a trip to face Munster in Limerick next Saturday. Jason Woodward: Gloucester top Pool 2. GLOUCESTER WILL HEAD to Thomond Park next weekend on top of Heineken Champions Cup Pool 2 after they ground out a 19-14 win at home to Castres. 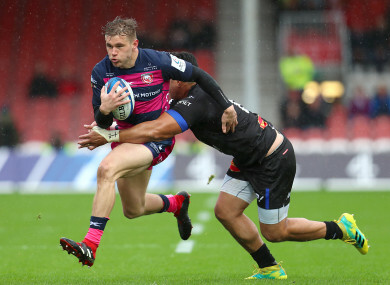 Following defeats for Wasps, Bath and Leicester on opening weekend — as well as Exeter’s draw against Munster — Gloucester got the Premiership clubs off the mark with a win at the fifth time of asking. Callum Braley’s first-half try separated the sides as Gloucester took a 13-6 lead into the break at Kingsholm. Danny Cipriani added two penalties to push the hosts’ lead out to 19-6 and set them on course for victory. Martin Laveau’s try, and a Julien Dumora penalty, gave Castres hope as the game entered the final 10 minutes but Gloucester’s defence withstood the late pressure to clinch the four points. Email “Gloucester get English clubs off the mark with Champions Cup win against Castres”. Feedback on “Gloucester get English clubs off the mark with Champions Cup win against Castres”.